Peter deals with JJJ’s new career on the cover of Amazing Spider-Man #11. Marvel’s Spider-Man is a great game, in part because of the way it pushes and pulls familiar characters from Spidey’s comics universe in new and intriguing ways. And it turns out, one of those particular twists is also going to happen in the Amazing Spider-Man comic later this year. The pro-Spidey angle is a hell of a twist—born out of the fact that JJJ learned Spider-Man’s true identity (err, again) in a heartbreaking issue of Spectacular Spider-Man last year. But the shock jock gig definitely echoes the incredible take Marvel’s Spider-Man—the popular if awkwardly-titled new PS4 game—has on Jameson. Now, you can’t really say it’s a direct inspiration unequivocally yet—after all, comics are planned and scripted months and months in advance, so it’s not like the success of Marvel’s Spider-Man had the Amazing Spider-Man team scrambling to pick and choose parts of it to bring along. It’s more of a fun confluence of convenient coincidences. But of all the characterizations the comics should borrow from the game’s world, this is definitely a very fun one to go with. 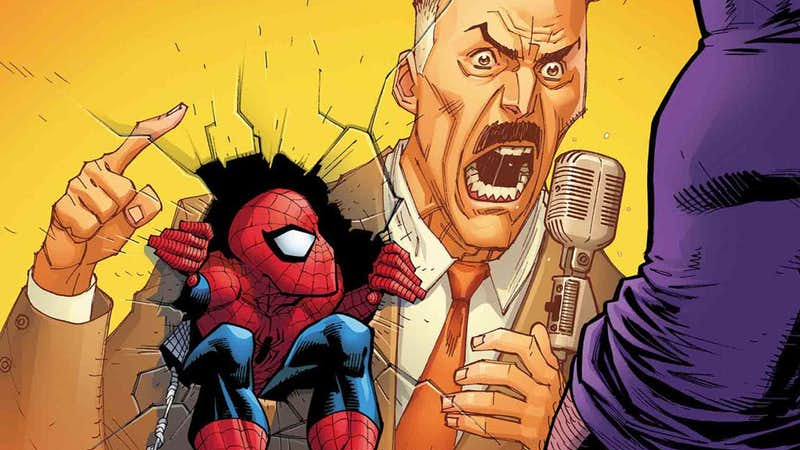 J. Jonah Jameson’s new career begins in the pages of Amazing Spider-Man #11 this December.